Surface treatment processes do not necessarily have to lead to an extremely high level of energy consumption. Through maintaining an open dialogue about ventilation options, we provide an overview of the correlation between investment and operating economy. "Being introduced to new technologies, which we may transform into energy saving processes, is good fun. We were surprised at the number of options available", says development manager Oluf Lauridsen. The heat exchangers and channel systems delivered to DS-SM have been energy-optimized to the fullest. The energy consumption level pertaining to heating and electricity has been reduced by almost 50% compared to traditional ventilation systems within the surface treatment industry. 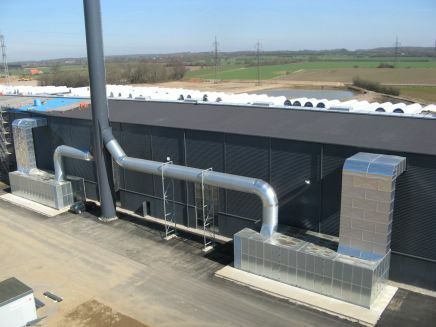 Treating the issue of ventilation as a tool rather than a necessary evil has meant that the result – shown to the right – is also an efficient tool. During the construction of a new workshop for surface treatment of windmill towers, Oluf Lauridsen, who works as development manager in the DS-SM coating department, was particularly aware of energy and environmental issues. This machine factory, located in southern Jutland, is owned by the DS group. Oluf Lauridsen head of development at DS SM’s coatingdepartment has had particular focus on the energi and environmental aspects when building a production factility for surface treatment of wind turbine towers.